Hand stretched sourdough baked in a wood-fired oven, with béchamel sauce, speck, crumbled Gorgonzola and fresh rosemary. Made with slow rising dough, our pizza bases are stretched by hand, and cooked on lava stones in a brick-lined wood-fired oven. The intense heat cooks quickly and evenly, keeping in all the flavour of the dough, and producing the thin, crisp crust you find in Italian pizzerias. 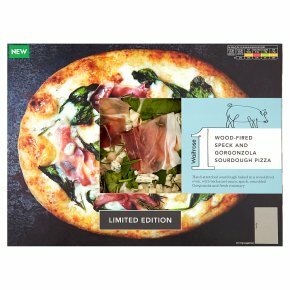 INGREDIENTS: Wheat flour, water, mozzarella cheese (milk), milk, SPECK (7%) (pork, salt, black pepper, juniper berries, preservatives sodium nitrite and potassium nitrate, allspice, garlic, white pepper, flavouring), Gorgonzola cheese (milk) (6%), rapeseed oil, fortified wheat flour (wheat flour, calcium carbonate, iron, niacin, thiamin), wheat semolina, whipping cream (milk), spinach (3%), extra virgin olive oil (1%), cornflour, yeast, salt, fresh rosemary (0.3%), wheatgerm flour, butter (milk), gelling agent pectins, wheat starch, white pepper, wheat malt flour.